The resolution of the trade impasse with Canada produced another big cap short squeeze. 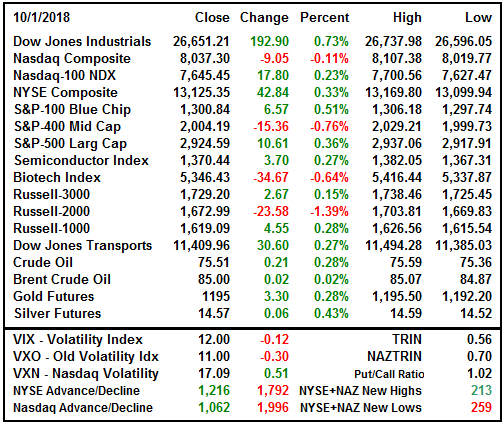 Most big cap tariff sensitive stocks exploded higher at the open and the Dow sprinted to an intraday high of 279 before traders came to their senses. The short squeeze was sold at noon and the S&P closed 13 points below its intraday high but maintained a healthy 10-point gain. The trade deal came down to the last minute as political deals normally do. Rarely does anyone capitulate in advance. The party under pressure waits until the last possible minute in hopes of working out a better deal. The Canadian agreement will be merged with the Mexican agreement and the new USMCA as it is called will be submitted to lawmakers to be approved. While this removes several layers of trade concerns from the market, the biggest problem remains. China is not in any hurry to negotiate and will wait until after the midterms to see if the political winds change. This did not stop the tariff sensitive stocks from exploding higher. Boeing (BA) jumped on the trade deal and news of a $2.5 billion order of 787-9 Dreamliners from United. The airline plans to have 40 in its fleet by year's end and another 24 on order. 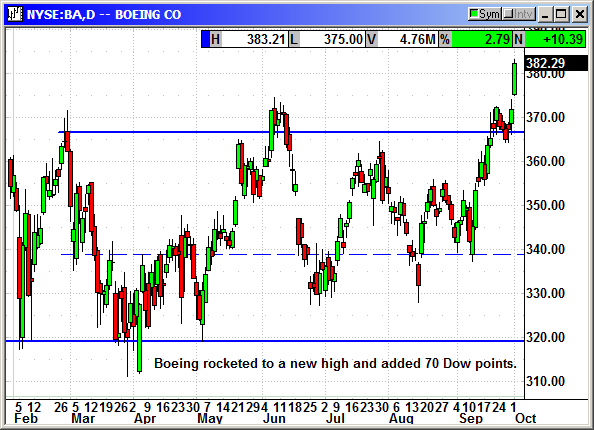 The $10 spike in Boeing added 70 points to the Dow. Tesla shares fell $43 on Friday and rebounded $45 today after Elon Musk announced a settlement with the SEC that will leave him as CEO of the company. Shorts celebrating their good fortune on Friday were crying again at Monday's open. 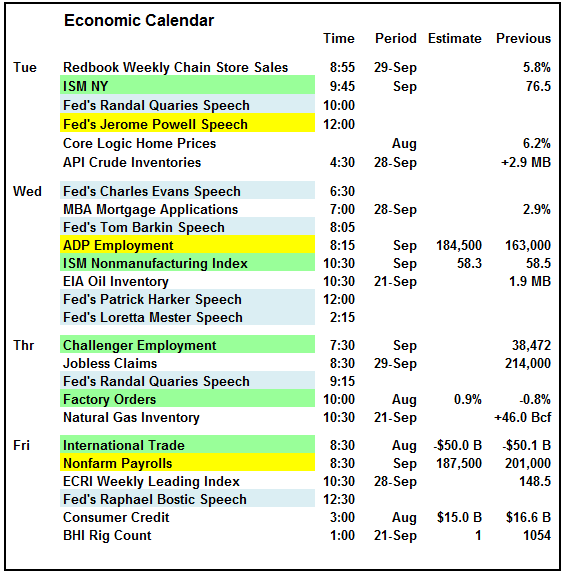 We have a busy calendar for the rest of the week with Fed Chairman Powell speaking at noon tomorrow followed by the ADP employment report on Wednesday. The Nonfarm payrolls close the week with expectations for just under 200,000 jobs. This is a light week for earnings with Paychex, Lennar, Costco and Constellation Brands the highpoints for the week. Costco would be my pick for a positive earnings surprise. They seem to be doing everything right. 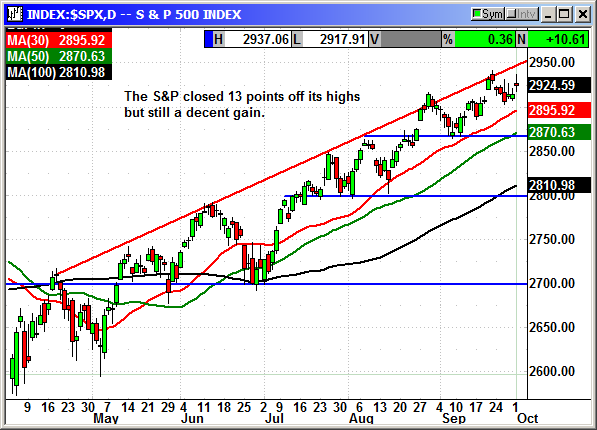 The S&P briefly traded in new high territory before fading in the afternoon. The index closed at the top of its recent congestion range and well under resistance at 2,950. However, the 30-day average has not been touched since mid August and the positive trend is still intact. 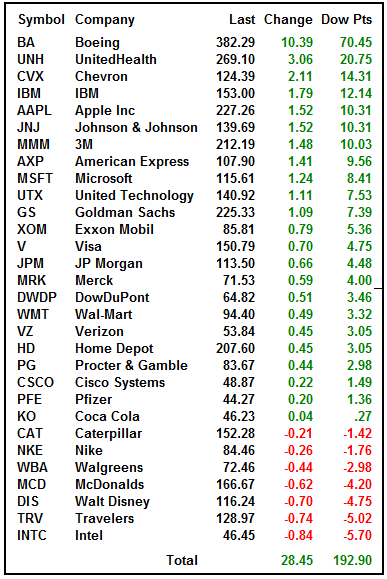 With the Q3 earnings cycle just ahead, there is a good chance we will see a continued rally. There was an interesting group at the top of the Dow leader board. The continued surge in crude prices lifted Chevron and other stocks were spiking on short squeeze pressures. 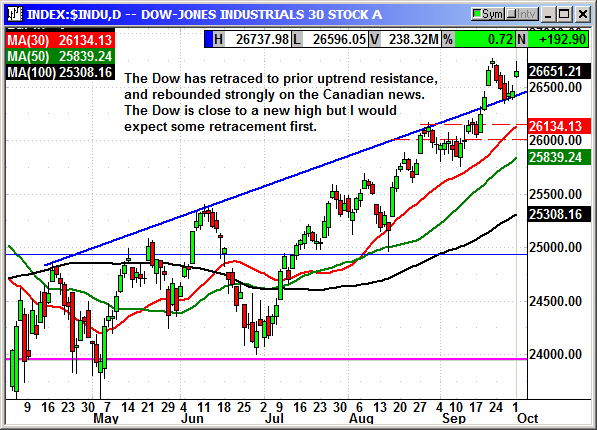 The Dow rebounded from prior resistance, which is now uptrend support. 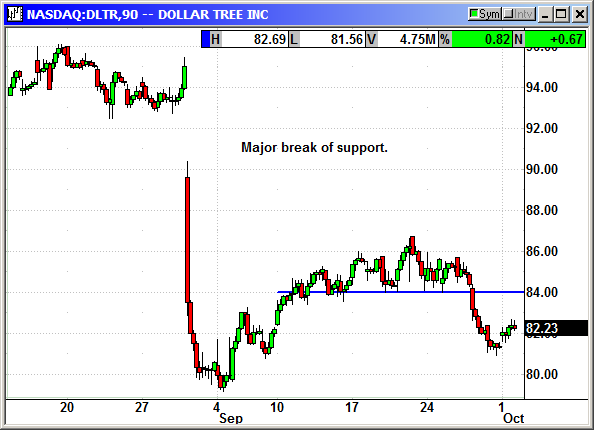 The index came close to a new high but could not seal the deal after sellers returned in the afternoon. I would not be surprised to see the Dow retuen to 26,500 before moving higher. 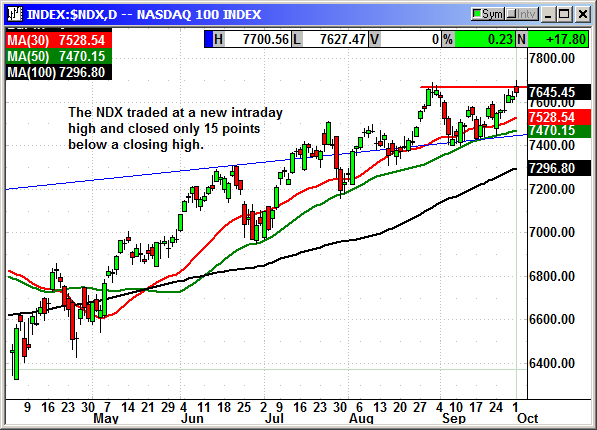 The Nasdaq 100 large cap index traded at a new intraday high and closed only 15 points below a new closing high. 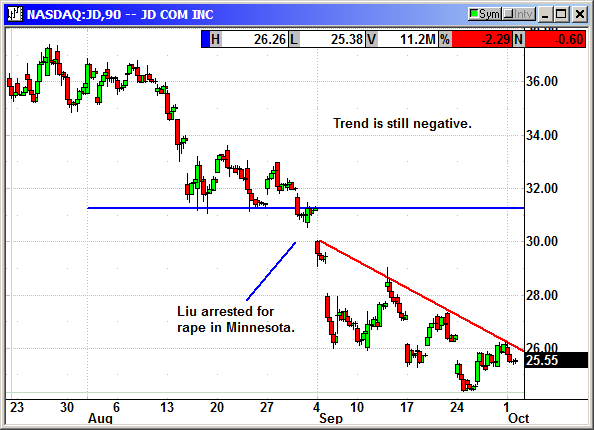 The Nasdaq Composite struggled because of the large number of small cap stocks in decline. They compoetely overpowered the gains from the large caps in that index. 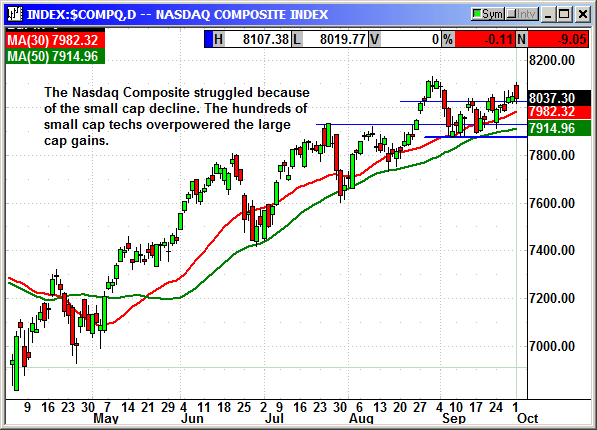 The Nasdaq Composite lost 9 points but the big news was the 70-point decline from the intraday high. This was a massive implosion driven by the small caps. The Russell 2000 was crushed by investors fleeing the tariff safety of small cap domestic stocks and running towards the beaten down large caps. The Russell lost 23 points and close 30 points below the intraday high. 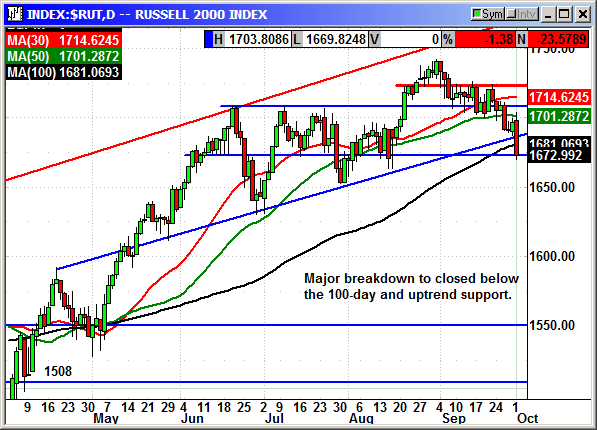 The Russell closed below uptrend support and below the 100-day average. With the A/D line 5:1 decliners over advancers, this could be considered a capitulation day. That does not mean there will not be any further selling but the pace could moderate. I would continue to recommend cautiously buying the dips. 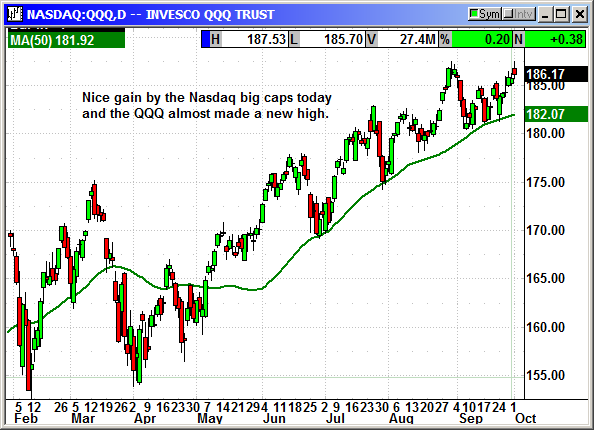 The big cap indexes are right at new highs and with Q3 earnings just ahead the market should continue higher. Headlines wil continue to provide daily direction but the overall trend should remain positive. Buy Dec $145 call, currently $3.65, stop loss $137.35. The short position was entered at the open on Tuesday. No specific news. Shares broke below support with the Nasdaq weakness. I had the stop loss too low and I wish we had been stopped out on the break. 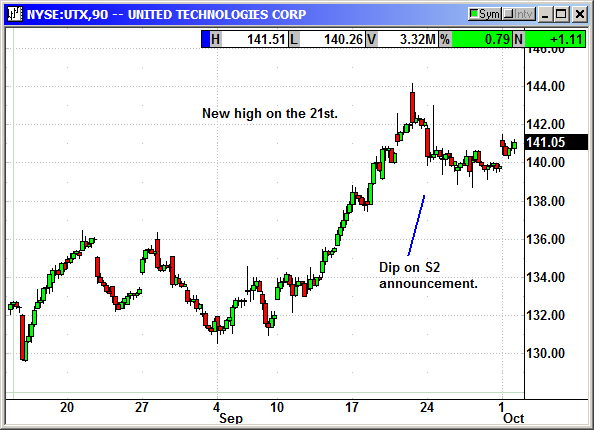 I raised it to just below Friday's low and will keep moving it higher if the stock continues its rebound. There was no news to cause the drop. The Nasdaq 100 Index posted a decent gain on Monday as the overall market rallied. The Nasdaq Composite posted a loss as small caps declined. The big caps techs should lead any Q3 rally and the QQQ almost made a new high on Monday. No specific news. Shares continued moving sideways with the Nasdaq weakness. 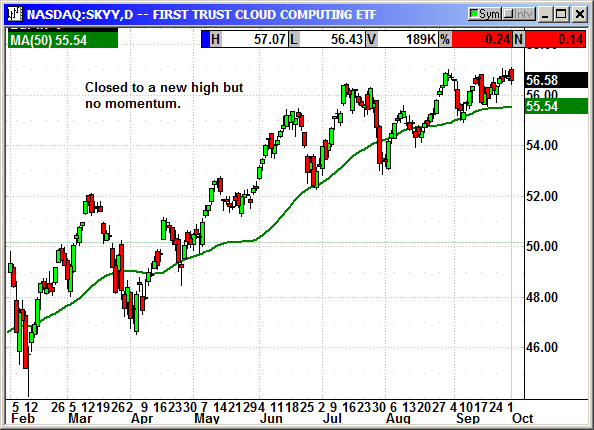 The stock made a new intraday high on Monday but there is no momentum. 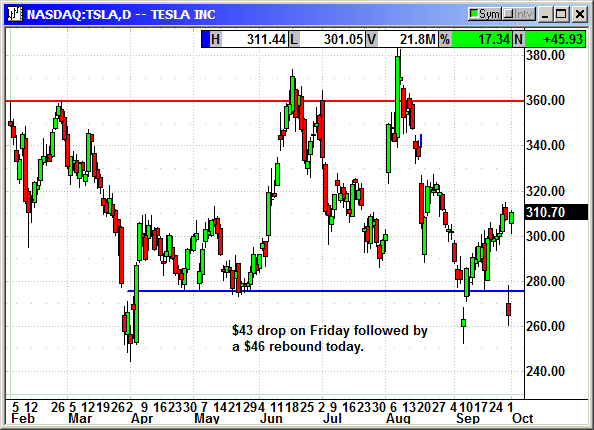 The strike at $57 is at the money with a $56.58 close but this is an October option. Without a breakout and a big rally, the premium is going to deflate quickly. I am recommending we close the position. That means it will probably spike 5 points over the next two weeks. 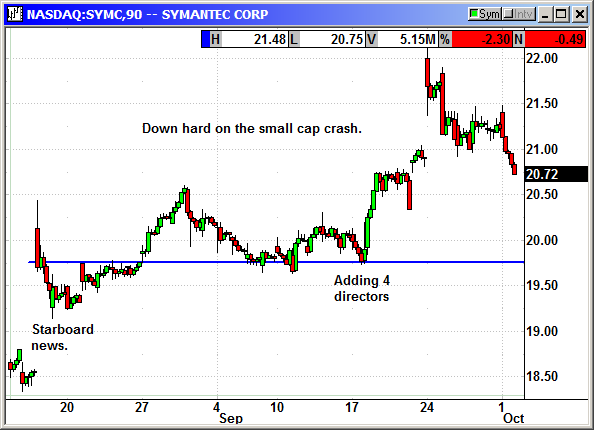 Symantec has given back all the post accounting probe gains. Shares fell -2.3% today with the weakness in small caps. The stock has everything going for it now that Starboard is adding 5 directors. They will either turn the company around or sell it quickly. I am going to stick with it for a couple more weeks. Update 9/24: Today Symantec announced it had concluded the review of its accounting practices and there was no need to restate prior results. The company had seen its shares dropped about 30% when it announced the probe four months ago. The only change in their results was a $13 million sale that was recognized as revenue in Q4 where the audit committee decided $12 million should have been deferred. Shares spiked 4% on the news. Stifel warned of a "long path to a margin ramp, key-person risk and macro uncertainty" as risks to stock performance. They cut the price target to $32 from $39 but the stock has already declined to $25. Shares are not declining but the trend is still negative. 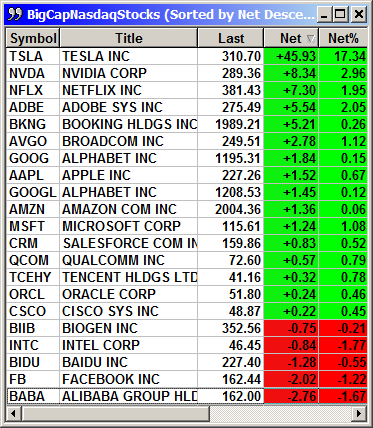 Long Jan $23 put @ $1.49, see portfolio graphic for stop loss. 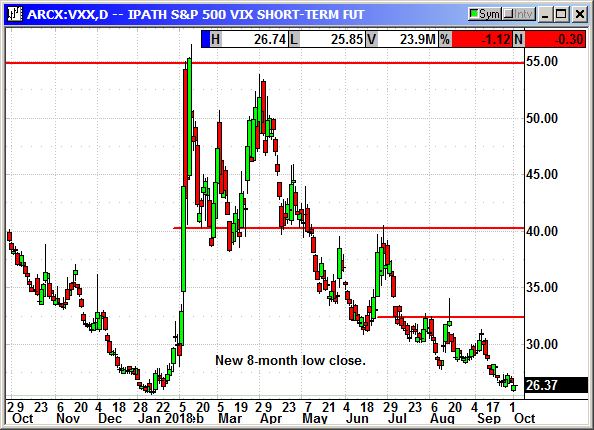 The VXX fell to a new 8-month low close and almost a historic close, which is now 25.84. This will go to single digits eventually because of the futures decay.